Learn to use GeoPandas by reading from common vector geospatial formats (shape files, GeoJSON, etc), PostGIS databases, and from geospatial data generated on the fly. Learn to leverage Pandas functionality in GeoPandas, for effective, mixed attribute-based and geospatial analyses. Learn about common geospatial operations, including reprojection, spatial joins, and overlays. GeoPandas adds a spatial geometry data type to Pandas and enables spatial operations on these types, using shapely. GeoPandas leverages Pandas together with several core open source geospatial packages and practices to provide a uniquely simple and convenient framework for handling geospatial feature data, operating on both geometries and attributes jointly, and as with Pandas, largely eliminating the need to iterate over features (rows). Also as with Pandas, it adds a very convenient and fine-tuned plotting method, and read/write methods that handle multiple file and “serialization” formats. While GeoPandas spatial objects can be assigned a Coordinate Reference System (CRS), operations can not be performed across CRS’s. Plus, geodetic (“unprojected”, lat-lon) CRS are not handled in a special way; the area of a geodetic polygon will be in degrees. GeoPandas builds on mature, stable and widely used packages (Pandas, shapely, etc). It is being supported more and more as a preferred Python data structure for geospatial vector data. If you’re comfortable with Pandas, R dataframes, or tabular/relational approaches. For polished map creation and multi-layer, interactive visualization; if you’re comfortable with GIS software, one option is to use a desktop GIS like QGIS! You can generate intermediate GIS files and plots with GeoPandas, then shift over to QGIS. 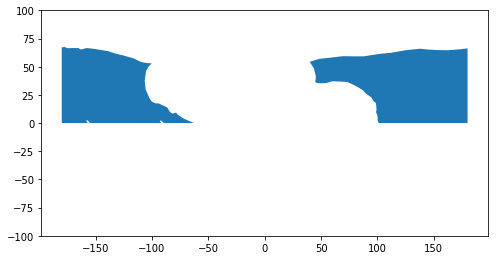 Or refine the plots in Python with matplotlib or additional packages. GeoPandas can help you manage and pre-process the data, and do initial visualizations. If you need very high performance, though I’m not sure about current limitations. Performance has been increasing and substantial enhancements are in the works (including possibly a Dask parallelization implementation). 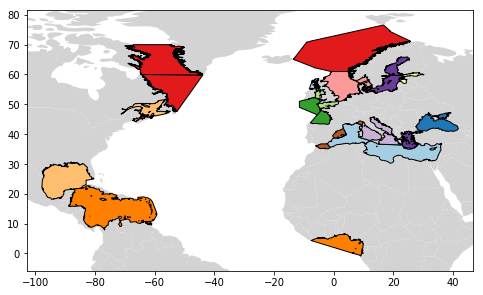 Like a Pandas Series, a GeoSeries is the building block for the more broadly useful and powerful GeoDataFrame that we’ll focus on in this tutorial. Here we’ll first take a bit of time to examine a GeoSeries. GeoPandas does not constrain the geometry column to be of the same geometry type. This can lead to unexpected problems if you’re not careful! Specially if you’re used to thinking of a GIS file format like shape files, which store a single geometry type. Also beware that certain export operations (say, to shape files …) will fail if the list of geometry objects is heterogeneous. But enough theory! Let’s get our hands dirty (so to speak) with code. We’ll start by illustrating how GeoSeries are constructured. Though you will rarely need this raw approach! A GeoSeries (and a GeoDataFrame) can store a CRS implicitly associated with the geometry column. This is useful as essential spatial metadata and for transformation (reprojection) to another CRS. Let’s assign the CRS. Let’s get a bit fancier, as a stepping stone to GeoDataFrames. First, we’ll define a simple dictionary of lists, that we’ll use again later. We’ll wrap up by creating a GeoSeries where we explicitly define the index values. 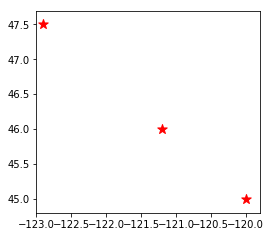 It’s worth noting that a GeoDataFrame can be described as a Feature Collection, where each row is a Feature, a geometry column is defined (thought the name of the column doesn’t have to be “geometry”), and the attribute Properties includes the other columns (the Pandas DataFrame part, if you will). More than one column can store geometry objects! We won’t explore this capability in this tutorial. We’ll build on the GeoSeries examples. Let’s reuse the data dictionary we defined earlier, this time to create a DataFrame. Now we use the DataFrame and the “list-of-shapely-Point-objects” approach to create a GeoDataFrame. Note the use of two DataFrame attribute columns, which are effectively just two simple Pandas Series. 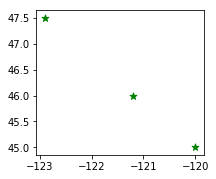 There’s nothing new to visualize, but this time we’re using the plot method from a GeoDataFrame, not from a GeoSeries. They’re not exactly the same thing under the hood. 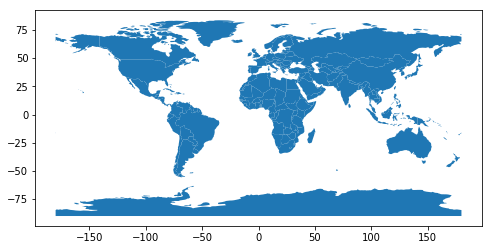 Now we finally plot a real map (or blobs, depending on your aesthetics), from a dataset that’s global-scale and stored in “geographic” (latitude & longitude) coordinates. It’s not the actual ocean shapes defined by coastal boundaries, but bear with me. 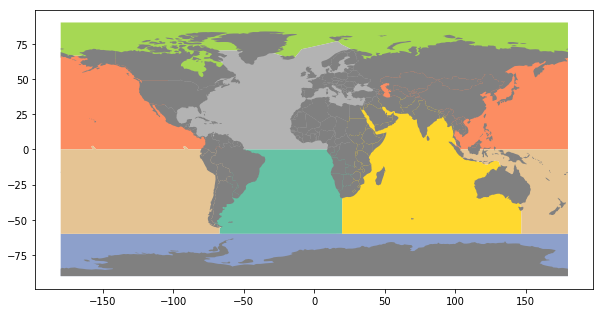 A colormap has been applied to distinguish the different Oceans. oceans.shp stores both Polygon and Multi-Polygon geometry types (a Polygon may also be viewed as a Multi-Polygon with 1 member). We can get at the geometry types and other geometry properties easily. Does it seem weird that some envelope bounding boxes, such as the North Pacific Ocean, span all longitudes? That’s because they’re Multi-Polygons with edges at the ends of the -180 and +180 degree coordinate range. “Natural Earth is a public domain map dataset available at 1:10m, 1:50m, and 1:110 million scales. Featuring tightly integrated vector and raster data, with Natural Earth you can make a variety of visually pleasing, well-crafted maps with cartography or GIS software.” A subset comes bundled with GeoPandas and is accessible from the gpd.datasets module. We’ll use it as a helpful global base layer map. Here’s a compact, quick way of using the GeoDataFrame plot method to overlay two GeoDataFrames while customizing the styles for each layer. Read from remote PostgreSQL/PostGIS database. The fact that it’s on an Amazon Cloud is irrelevant. The approach is independent of the location of the database server; it could be on your computer. First we’ll read the database connection information from a hidden JSON file, to add a level of security and not expose all that information on the github GeoHackWeek repository. This is also a good practice for handling sensitive information. Close the connection. Clean up after yourself. Let’s take a look at the GeoDataFrame. 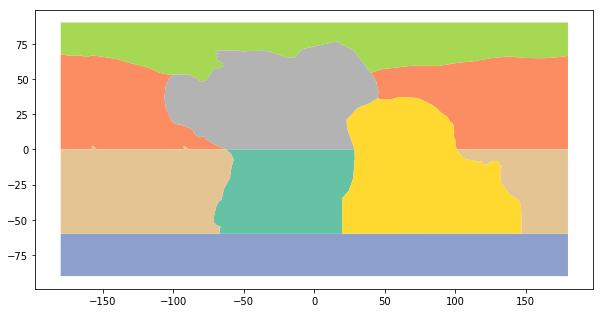 Color the layer based on one column that aggregates individual polygons; using a categorical map, as before, but explicitly selecting the column (column='oceans') and categorical mapping (categorical=True); displaying an auto-generated legend, while displaying all polygon boundaries. 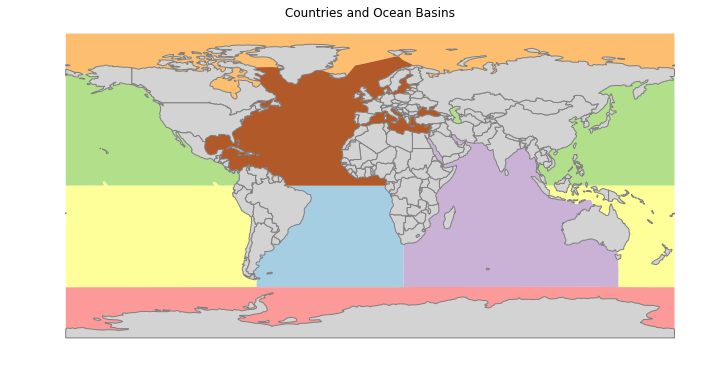 Each “oceans” entry (ocean basins, actually) contain one or more ‘seas’. See http://darribas.org/gds17/labs/Lab_02.html for great examples of lots of other cool GeoPandas map plotting tips. Combine what we’ve learned. 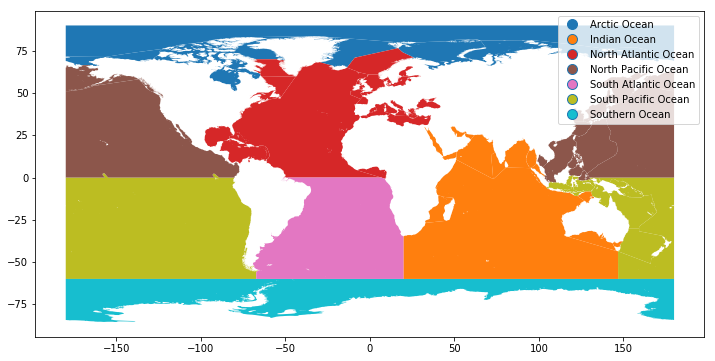 A map overlay, using world as a background layer, and filtering seas based on an attribute value (from oceans column) and an auto-derived GeoPandas geometry attribute (area). world is in gray, while the filtered seas is in color. The to_file method uses the fiona package to write to a GIS file. The default driver for output file format is ‘ESRI Shapefile’, but many others are available because fiona leverages GDAL/OGR. We won’t go into all details about what’s going on. Suffice it to say that we issue an OGC WFS request for all features from the layer named “oa:goainv” found in a GeoServer instance from NANOOS, requesting the response in GeoJSON format. Then we use the geojson package to “load” the raw response (a GeoJSON string) into a geojson feature object (a dictionary-like object). The “oa:goainv” layer is a global dataset of monitoring sites and cruises where data relevant to ocean acidification are collected. It’s a work in progress from the Global Ocean Acidification Observation Network (GOA-ON); for additional information see the GOA-ON Data Portal. Let’s examine the general characteristics of this GeoJSON object, including its __geo_interface__ interface, which we discussed earlier. Now use the from_features constructor method to create a GeoDataFrame directly from the geojson.feature.FeatureCollection object. 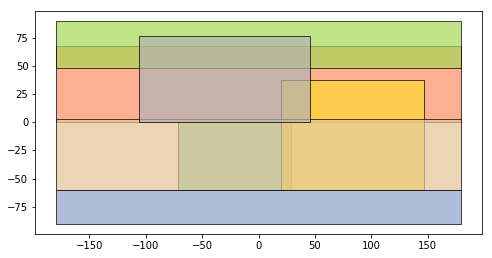 Finally, let’s visualize the data set as a simple map overlay plot; and as an example, display the values for the last feature. Let’s stop for a bit to explore on your own, hack with your neighbors, ask questions. Then we’ll transition to the next notebook, on more advanced topics. 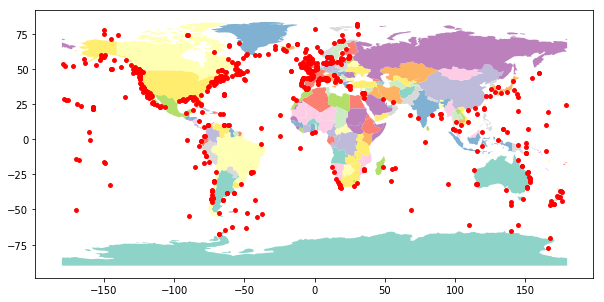 Leveraging Pandas and core vector geospatial libraries, Python GeoPandas greatly simplifies the use of vector geospatial data and provides powerful capabilities.